The Ward laboratory is run jointly with the laboratory of Professor Raimund Ober. The research is directed towards taking a highly interdisciplinary approach to generate effective therapeutics for autoimmunity and cancer. This involves a combination of antibody/protein engineering, fluorescence microscopy and in vivo studies in mouse models of disease. 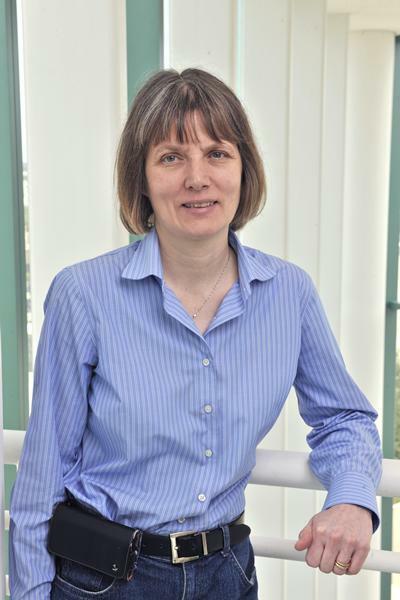 Sally Ward is a Professor of Molecular Immunology, and Director of Translational Immunology at the Centre for Cancer Immunology within the Faculty of Medicine at the University of Southampton. Professor Ward received her BA with First Class Honours in natural sciences (Part II course, biochemistry), University of Cambridge, U.K., in 1982 and completed her PhD in biochemistry at the Department of Biochemistry, University of Cambridge, under the mentorship of Professor David J. Ellar in 1985. From 1988 to 1990 she held the Stanley Elmore Senior Medical Research Fellow at Sidney Sussex College, Cambridge whilst working with Sir Greg Winter at the MRC Laboratory of Molecular Biology, Cambridge, U.K.
Prof. Ward’s current research includes the use of a combination of fluorescence imaging, protein engineering and in vivo studies to develop therapeutics to treat cancer and autoimmunity. Minguela, A., Pastor, S., Mi, W., Richardson, J. A., & Ward, E. S. (2007). Feedback regulation of murine autoimmunity via dominant anti-inflammatory effects of interferon γ. Journal of Immunology, 178(1), 134-144. Braciak, T. A., Pedersen, B., Chin, J., Hsiao, C., Ward, E. S., Maricic, I., ... Kumar, V. (2003). Protection against experimental autoimmune encephalomyelitis generated by a recombinant adenovirus vector expressing the V β8.2 TCR is disrupted by coadministration with vectors expressing either IL-4 or -10. Journal of Immunology, 170(2), 765-774. Dall' Acqua, W. F., Woods, R. M., Ward, E. S., Palaszynski, S. R., Patel, N. K., Brewah, Y. A., ... Langermann, S. (2002). Increasing the affinity of a human IgG1 for the neonatal Fc receptor: Biological consequences. Journal of Immunology, 169(9), 5171-5180. Radu, C. G., Ober, B. T., Colantonio, L., Qadri, A., & Ward, E. S. (1998). Expression and characterization of recombinant soluble peptide: I-A complexes associated with murine experimental autoimmune diseases. Journal of Immunology, 160(12), 5915-5921. Medesan, C., Matesoi, D., Radu, C., Ghetie, V., & Ward, E. S. (1997). Delineation of the Amino Acid Residues Involved in Transcytosis and Catabolism of Mouse IgG1. Journal of Immunology, 158(5), 2211-2217. Kumar, V., Coulsell, E., Ober, B., Hubbard, G., Sercarz, E., & Ward, E. S. (1997). Recombinant T cell receptor molecules can prevent and reverse experimental autoimmune encephalomyelitis dose effects and involvement of both CD4 and CD8 T cells. Journal of Immunology, 159(10), 5150-5156. Rosloniec, E. F., Brand, D. D., Whittington, K. B., Stuart, J. M., Ciubotaru, M., & Ward, E. S. (1995). Vaccination with a recombinant Vα domain of a TCR prevents the development of collagen-induced arthritis. Journal of Immunology, 155(9), 4504-4511. Filikov, A. V., Jones, J. R., Myasoedov, N. F., & Ward, E. S. (1994). Application of solid state catalytic hydrogen isotope exchange to the tritium labeling of lysozyme. Journal of Labelled Compounds and Radiopharmaceuticals, 35, 179-185. Borrebaeck, C. A. K., Malmborg, A. C., Furebring, C., Michaelsson, A., Ward, S., Danielsson, L., & Ohlin, M. (1992). Kinetic analysis of recombinant antibody-antigen interactions: Relation between structural domains and antigen binding. Nature Biotechnology, 10(6). Ward, E. S., Güssow, D., Griffiths, A. D., Jones, P. T., & Winter, G. (1991). Hot papers. Scientist, 5(9). Gussow, D., Ward, E. S., Griffiths, A. D., Jones, P. T., & Winter, G. (1989). Generating binding activities from Escherichia coli by expression of a repertoire of immunoglobulin variable domains. Cold Spring Harbor Symposia on Quantitative Biology, 54(1), 265-272. Ward, E. S., & Ghetie, V. (1995). The effector functions of immunoglobulins: Implications for therapy. Therapeutic Immunology, 2(2), 77-94. Ward, E. S. (1992). Antibody engineering: The use of Escherichia coli as an expression host. FASEB Journal, 6(7), 2422-2427. Cumber, A. J., Ward, E. S., Winter, G., Parnell, G. D., & Wawrzynczak, E. J. (1992). Comparative stabilities in vitro and in vivo of a recombinant mouse antibody FvCys fragment and a bisFvCys conjugate. Journal of Immunology, 149(1), 120-126. Joint Principal Investigators: E. Sally Ward PhD and Raimund Ober PhD.